Get first-rate web design and dev expertise for half the normal price. 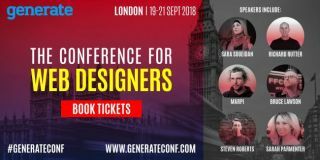 Given that Generate London offers an unparalleled opportunity to learn direct from some of web design’s brightest minds, there are already plenty of good reasons to buy a ticket. But generous souls as we are, we’ve decided to add another: for just 24-hours only – running from midnight to midnight BST – you’ll be able to get 50 per cent off full-price tickets in our flash sale, meaning two days of conference and a full day of workshops can be yours for just £297.50. Out of the gate, your ticket will give you the opportunity to attend conference sessions from the industry’s best and brightest designers and devs. For example, Ricardo Cabello, the designer and developer who brought the world three.js and frame/js, will explore the WebVR and WebXR APIs and help you to start crafting your first VR and AR projects with three.js. Meanwhile, keynote speaker and founder of You Know Who, Sarah Parmenter will offer up insight into making sites marketing sing, covering how to hold quarterly website design reviews with a “design once use everywhere” mantra and diving into the ever changing world of Instagram algorithms, Facebook marketing, and topical social media takeaways. So if you want to save some cash while securing your place at the hottest conference in web design, don’t hesitate: grab your ticket to Generate London this Thursday.